Johnson is incredibly talented as a ventriloquist and is also an excellent spokesperson for the craft. His explanation of how a ventriloquist act has to be structured was, for me, the turning point in the film. 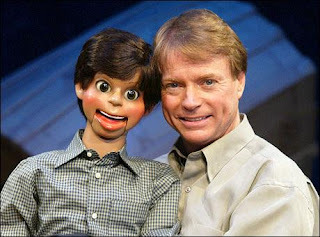 While I always enjoyed Johnson’s work on Soap, I never really liked ventriloquism. A matter of fact, I often found it a bit creepy (some vestigial unease due to the 1978 movie Magic, no doubt), and usually unfunny. Watching Johnson work, though, was revelatory. Johnson goes to great lengths to explain how effective a good ventriloquist can be in creating a moment of comedy that is unique to the art form. 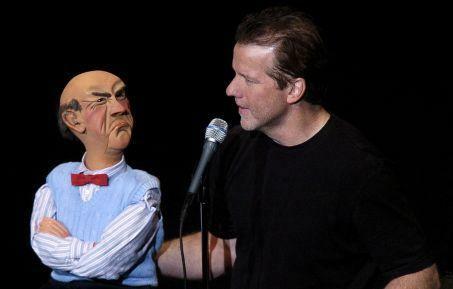 Johnson calls it “revealing the trick,” and it occurs when the ventriloquist is able to make the audience forget for a moment that ventriloquism is, in its way, an illusion – there is, after all, only one person on stage, not two – and right when that moment occurs, when the audience imbues the dummy with a consciousness, the ventriloquist has the dummy expose the fact that it is not real and is only a construct. Johnson’s breakdown of “revealing the trick” sent my mind on a course questioning some of the fundamental assumptions we make on a daily basis. What is behind our constant anthropomorphism of the world around us? Why do we need to “relate” to the objects and creatures with which we interact? And also, what does it say about us as sense making being when we are so easily manipulated into believing something that we so obviously know is not true (a question that gains in resonance as the political season heats up)? I’m No Dummy celebrates the talents of some of the more prominent players in the history of ventriloquism. These include the likes of Edgar Bergan, Jimmy Nelson, Senor Wences, and Paul Winchell. The film also tries to make the case that, while declining in popularity, ventriloquism still has a place in the world of comedy. It does this through interviews with Johnson, as well as Lynn Trefzger and Jeff Dunham. For all intents and purposes, Jeff Dunham is a wildly successful comedian, playing sold out shows, getting specials on cable TV, moving huge numbers of DVD’s and related merchandise. In the film, though, he seems to be constantly apologizing for being a ventriloquist and comes off as a pretty weak spokesperson for the validity of his chosen profession. 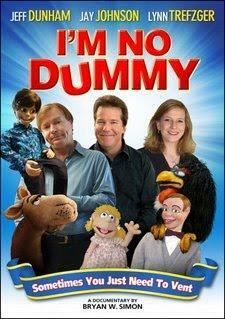 All in all, I’m No Dummy is a fair documentary about ventriloquism. It does seem to be a bit hastily thrown together and, other than the revelations of Jay Johnson, serves as more of a rah-rah session for ventriloquists than as a documentary. The film runs for 86 minutes which seems to be about 26 minutes too long. The real highlight of the film is Johnson’s interviews and performances. Through watching the film I learned that Johnson won a Tony for his play “The Two and Only.” The next time I want to see anything about ventriloquism, I think I will seek this performance out instead.